Biking the Divide » Blog Archive » Done. Spirits were high when we woke today. With only 21 miles along easy, paved roads, we felt confident we would finally complete our goal. Despite yesterday’s Border Patrol warnings, we were pleasantly surprised by the south-of-the-border hospitality provided by the people we shared last night’s campsite with. Just kidding, the night passed by uneventfully. Upon waking however, last night’s secret campsite was now visible from the road. Several Border Patrol vehicles sped past us before one eventually came to quick stop and carefully approached us, his hand never too far from his taser. Once he realized we were just biking through, he congratulated us on being (nearly) finished, then sped off in search of other forms of vagrants. 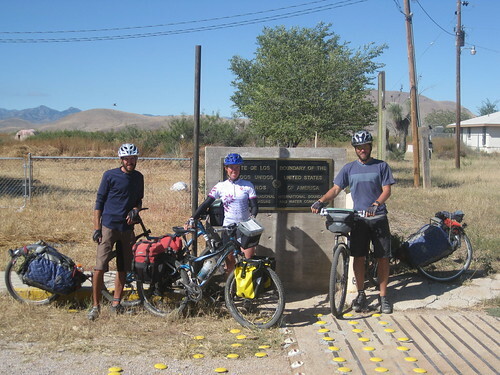 After breaking camp, we began our ride along the final 21 miles of highway to the border. The first 15 miles flew by, with the mountains of Mexico visible the whole time. With only 5 miles left, our pace was disrupted by an event we thought might end our trip 5 miles too early. Off the side of the ride ahead were two bison, grazing in a fenced pasture, a scene we’ve seen countless times on this trip. These two bison were different however, they appeared to take keen interest in us. As we rode on, the bison ran along the fence in parallel with us. Then it happened, something we never imagined bison were capable of doing – they jumped the fence, leaping onto the road ahead of us. We skidded to a halt with the bison about 100 feet in front of us. As we each started an about-turn, the bison raced across the road, then jumped another fence before running off into the distance. Startled, yet impressed, by their physical feat, we let out a sigh of relieve and continued on our way toward the border. The next 5 miles flew by without incident and we cruised into the border patrol station of Antelope Wells, NM. Upon reaching the U.S. station we stopped, expecting to have our passports examined. Instead we were greeted with “What are ya stopping for? You’re not there yet!” With that, we pushed our bikes the few remaining feet to Mile 0, crossing the border into Mexico. Since we were there, we decided to ride into Mexico a little ways, mainly so our GPS would clearly register our position. So we pushed our bikes into the Mexican border station, where two guards couldn’t have cared less about our presence. We understood their lack of acknowledgment as a sign we could continue, so we cruised about 100 yards into Mexico, where we enjoyed a mountain margarita before returning to the U.S. While south-of-the-border, our chauffeur showed up, so upon returning to the States we quickly packed our bikes, gear and bodies into his car. For Brett, this was the first time in a motorized vehicle since Banff, Alberta, more than 3,000 miles ago. On the way back to Silver City we told our driver, Ryan, about our journey and he shared stories about the other GDR rider and CD hikers he’s picked over the past weeks. Back in Silver City, we picked up our reserved Uhaul truck, loaded our bikes and gear into the back and started our drive back to Phoenix, where Jeff lives. Along the way we began to notice signs for “The Thing?”. Always accompanied by a Dairy Queen logo, we took guesses at to what this crazy soft-serve creation might be. Much to our disappointment “The Thing?” was just a cheesy, chintzy souvenir shop. The ice cream was worth the stop though. Stuffed on Dairy Queen Blizzards we drove non-stop back to Phoenix and the comfort of Jeff’s house. After 66 days, and more than 3,000 miles of biking, our trip has officially ended.